The limestone ironshore of Long Cay, Chalk Sound. One of three Long Cays in the Turks and Caicos, this rocky cay is Chalk Sound on Providenciales is the least recognized. A very thin island, Long Cay is only about 600 feet long and is separated from Isaac Cay by a shallow channel that’s only a few feet across. Like nearly all cays in Chalk Sound, Long Cay in mainly ironshore limestone and is covered in low vegetation. 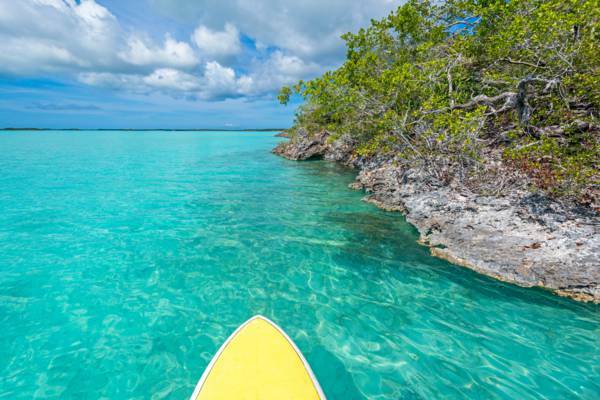 Stand up paddle boarding off of Long Cay.